We are now in front of the side entrance. To the left you can see part of the entrance to the university, that I will show elsewhere. The main entrance to the mosque is around the corner. The part where the türbes are is out of sight to the right and in the back of the mosque. 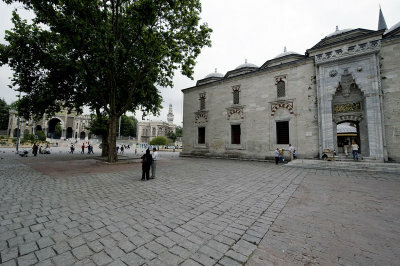 The square surrounding the mosque is huge and is often used for demonstrations of other events. The covered bazaar is "straight on" (passing through the mosque).